I wish to declare … an eloquence that means what it says, that gives life to mud. Since paintings can’t be talked about, then the only thing to do is to try to talk about them. During his second one-man show at Betty Parsons Gallery in New York in April 1951, abstract expressionist painter Barnett Newman (1905–1970) exhibited a large, untitled oil painting, now known as Adam (Tate T01091; fig.1). At two and a half metres high by two metres wide, the canvas then comprised just three elements: a large expanse of deep, reddish brown and two bright red bands running from the top to the bottom of the canvas.3 The visual reach of the amplified field was constrained laterally on both sides: on the left, by the broad plank of cadmium red that firmly declared the painting’s framing edge; and less emphatically on the right by a much narrower, two-centimetre strip of the same colour running parallel to the right edge, at a distance of fifteen centimetres. This In Focus proceeds in five parts. In the present essay I examine Newman’s decision to add the third band in light of the structure of beholding that it allowed him to establish for the painting’s viewers. At the same time, I attend to how some of the artist’s statements on meaning can be brought to bear on the interpretation of Adam’s pictorial effects. The second essay considers the symbolic relationship of Adam (the painting) to both Adam (the biblical first man) and to Newman’s own creative act as a painter. This assessment is followed by an investigation of certain photographs of Newman posing in front of his works, in which I contend that the staged character of the portraits – or better, their formal structure of implication – helps us understand more precisely Newman’s commitment to the persistence of human ‘figuration’ within a manifestly ‘abstract’ technical practice. In the fourth essay, art historian Michael Leja discusses the significance of ‘beginnings’ for Newman and his abstract expressionist peers, while analysing the cultural and philosophical stakes of their interest in origins and originality. Finally, art historian James Finch maps the exhibition and collection history of Adam, demonstrating the key role the painting played in the public’s appraisal of Newman’s art in the late 1950s. Elsewhere in this In Focus it will be important to remember that the other painting to which Newman refers is Vir Heroicus Sublimis 1950, 1951 (fig.4) – but for now, his statement might lead us to wonder, what was the ‘something’ that was missing?19 Working backwards from the solution – the addition of the third band, and the painting’s eventual name – the answer could be simple: what must have been missing was Adam (or, taking him as a representative, ‘human scale’ in general). Given Newman’s commitment to abstraction, it would be unreasonable to expect Adam to depict the biblical first man.20 But it must have been the case that, with its erect column, Newman (eventually) found his painting to harbour something like an expression of Adam’s existence, or being, or agency. Said somewhat differently, Adam’s content involves the implications of Adam having been created and as having been the first man. For Newman, such an understanding would have resulted not simply from an exegetical project (a matter of his interpreting from the book of Genesis what God had done or meant to do in creating Adam and Eve), but rather from a self-reflective one (a matter of Newman trying to understand from his own painting what he had done or meant to do in making Adam). It would not have been lost on the habitual wordsmith that his double reflection on Adam as the ‘first man’, and on himself as the ‘New-man’, could be at once broadly metaphysical and specifically pictorial. I will say more about the shared proximity of Newman and his companion to the painting’s surface – and specifically about the shadows their bodies cast upon the plane – in another part of this In Focus.23 First, though, I want to point out that Newman’s ‘short distance’ is an insufficient standard: inexact, it is nonetheless too specific to cover the variable distances that his individual paintings indeed seem to require. The ideal distance from which to view each painting is guided and controlled, I would suggest, by each work’s particular pictorial effects. Those standpoints are determined by Newman, who formally and technically projects them.24 Describing the general effect of his works, commentators often remark on the impression that the imagistic plane, especially in its striking quality of seeming to face the viewer all at once, situates them at a distance (alternatively, they claim to feel absorbed by the colour’s radiance).25 In the case of Adam, that distance is about four to five feet away; for Eve, it is about eight to nine feet. That is the approximate distance from which relatively small variations in surface manufacture are still grasped in their particularity – such as the feathering of paint along the right edge of Adam’s leftmost band; the bleeding and spattering of paint along the central band’s left side, like miniature solar flares; and the uneven density of application that causes the thinnest zip to waver in and out of perception. At the same time, this distance allows the abundant visual force of the whole surface area, and the impenetrability of its flattened space, to seal the belonging of its constituent ‘elements’ into the totality of the virtual plane. As we can now see, things changed in 1952. With the addition of Adam’s third band, Newman moderated the apparent ubiquity of the deep brown field by creating an internal structure with an almost skeletal power to hold the plane together as an imagistic totality. The sweep of vision, previously unconstrained, is now checked in the vertical dimension by the sense of compression that, as I claimed above, the angled strut has a role in producing through its slight buckling. And although Newman would have given little weight to observations regarding merely compositional concerns, it is nonetheless noticeable that the right half of the field has become more balanced with the left, thereby reducing the impression that the thin band diminishes in size due to spatial recession. In particular, note that the broadest curtain of shaded colour – between the thin zip and the ‘new’ central beam – is about twice the width of the one on the pole’s other side. When factoring in the visual weight each band contributes to its local area, the newly stable proportions have the effect of compositionally balancing the left and right halves of the picture. An additional consequence of this intuitively sensed symmetry is that the fifteen-centimetre-wide belt of brown between the thin zip and its closest edge is now transformed into a kind of brace in its own right – one that not only mirrors, in inverse value, the actual size and virtual scale of the brighter band on the left side of the canvas, but that also recapitulates the pictorial role the marginal red zip had played in securing the roving gaze from exceeding the painting’s limit. We are now in a position to see that scale is not a property of objects, but a subjective achievement – and, crucially, one that emerges through relationship. In fact, it would be better to think of scale as an intersubjective achievement rather than a self-generated one. According to Newman, it comes from a sense of one’s standing, apart from the painting, yet in equilibrium with it: think of a set of vintage hanging scales, the instrument that balances one weight in relation to another. To rephrase the description of Adam’s scale: the re-created painting seals itself against the viewer’s imaginative passage into depth; it defeats his or her tendency to drift into its expanding field of colour as if it were an atmosphere permeating a volumetric space, and to ‘lose’ him- or herself in it.33 Rather, it positions the viewer, and in doing so establishes the conditions under which Newman’s structure of beholding asserts the primacy of relationship. To encounter a painting by Newman is to encounter a virtual entity that magnetises one’s relation to oneself around one’s relation to another. The meeting gives the mutual relationship structure. Two people who see one another (not just look at each other) create an intersubjective totality. In a sense, they call for each other. Likewise, in Adam’s case, it is as if the addition of its central band were somehow motivated into its existence by the others in such a way that their mere adjacency is subsumed into a larger structure or continuum, a real relationship. The ‘elements’ simultaneously articulate that continuum as they (paradoxically) generate it: they ‘brin[g] each other to life’, as Newman once said of his fields and bands of colour. They are bound in their mutual self-definition by necessity. The elimination of contingency from the relations he produces is meant to affirm the totality or autonomy of the work of art. That, in turn, institutes Adam’s mode of pictorial address and gives us – each of us, as the separate viewers we are – the chance to understand the independent point of view that it projects.41 Think of the creation of Adam – not only the biblical first man, but also Newman’s painting – as a very special instance of seeing or meeting another person for the first time. Before closing this discussion, some brief remarks on the stakes of this interpretation might be helpful. What I have offered so far is an account of meaning that progresses from the description of pictorial effects to the elucidation of the modes of address those effects institute. Technically and formally managing the mutual determination of effects and address within or against the conventions of the medium, one could say, was Newman’s way of creating the structures of beholding he envisioned as governing the artist-audience exchange. His construction of the standpoint he intends the viewer to assume in relationship to the work is fundamental to the meaning it holds. Grasping the content of his paintings – their human content – stands or falls on the viewer’s willingness to adopt the point of view Newman projects. Only then may the beholder be in a position to understand his expression.42 In elucidating this reciprocal possibility, formal criticism is an essential tool. For if we cannot convincingly describe what Newman’s paintings are – and thus what their pictorial effects are meant to be – we will remain unable to fathom their immanent meaning as creative expressions, as the real statements about the self, experience and history that they are. What the canvas is actually and materially, and how we experience it as an object, is something entirely different from what the painting is about, from what Newman’s creative proposition is in Adam. It can be instructive to think about the tension we encounter, as contemporary viewers, between our expectations of a trans-historical symbolic meaning and what the painting delivers in its effects at any given moment in our experience. In the discrepancy between Newman’s titular reference (the Adam of Genesis) and the work of art’s structure of beholding (Adam the painting) we confront a methodological problem of great significance. How should our interpretation advance? Should we simply attend to the experience of effects, and treat the object as an occasion for our responses, however arbitrary they might be? Or should we endeavour to explain Newman’s canvas as the product of its historical moment by accumulating various kinds of empirical evidence, which tends to reduce our understanding of the work according to an inventory of its putative ‘causes’? In taking either approach, it would seem, we will have adopted a methodological standpoint that isolates Newman’s art. We either confine it to the past or to the solipsism of a present experience. It is this impasse that the formal criticism and interpretation of structures of beholding is meant to overcome. Newman’s paintings are made in relation to certain conventions of the medium, which operate as the constraining limits and generative possibilities of expression within the medium of painting itself. Those conventions also provide us with a framework to evaluate the expression as valid – which is to say, they provide the criteria against which we accept or reject the artist’s work as embodying a meaning that transcends the local contexts of its production and reception. In other words, Newman (an agent from whom we are temporally and spatially remote) invites us, within and through his work, to occupy the place it projects, and thus to share in its authority, which is independent of the historically contingent factors to which we frequently appeal, as if by methodological default, in order to explain the work’s existence. But this is not to say that factors outside the work cannot help us interpret his meaning. Rather, it is to say that when we appeal to those factors, our account of them – like our interpretation of the painting itself – must proceed from how, or in what qualitative ways, they illuminate Newman’s intentions as an artist. Above all, we must not presume them to provide the ‘empirical’ grounds by which we somehow document Newman’s ‘metaphysical’ achievement. 1. Barnett Newman, ‘From Exhibition of the United States of America’ , in John O’Neill (ed. ), Barnett Newman: Selected Writings and Interviews, Berkeley 1990, p.187. 2. Barnett Newman, ‘Problems and Issues in Art Today’ , quoted in Melissa Ho, ‘Chronology’, in Ann Temkin (ed. ), Barnett Newman, exhibition catalogue, Philadelphia Museum of Art, Philadelphia 2002, p.330. Emphasis added. 3. Temkin 2002, p.192. 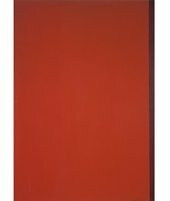 The painting was labelled as ‘5–1951’ in lieu of a title: see Richard Shiff, Carol C. Mancusi-Ungaro and Heidi Colsman-Freyberger, Barnett Newman: A Catalogue Raisonné, New Haven 2004, p.240. 4. Newman discusses the two distinct states of the painting’s completion in ‘Interview with Karlis Osis’ , unpublished transcript, Barnett Newman Foundation Archives, New York, p.23. Adam was originally painted in Newman’s studio at 110 Wall Street in downtown Manhattan. Although the precise date of the revision is unknown, Newman made it either there or in a new studio at nearby 100 Front Street, to which he moved in August 1952. For a discussion of Newman’s ideas regarding artistic creation, see Michael Leja, ‘Adam and Newman’s Beginnings’, in Michael Schreyach (ed. ), In Focus: ‘Adam’ 1951, 1952 by Barnett Newman, July 2018. Further contextual information on Adam can be found in James Finch, ‘Adam: An Early Exhibition and Ownership History’, in Schreyach 2018. For a consideration of the relationship of Newman’s biography and historical background to his art and philosophy, see Michael Schreyach, ‘Barnett Newman’, in Michael Kelly (ed. ), The Encyclopedia of Aesthetics, 2nd edn, 6 vols., Oxford 2014, vol.4, pp.496–9. 5. Newman referred to his bands or ‘zips’ as ‘streaks of light’ in ‘Interview with Emile de Antonio’ , in O’Neill 1990, p.306. 6. Barnett Newman, ‘“The Case for ‘Exporting’ Nation’s Avant-Garde Art”: Interview with Andrew Hudson’ , in O’Neill 1990, p.273. Newman often chose titles that suggest temporal or physical location: Moment 1946 (Tate T05501); Be I 1949 (Menil Collection, Houston); Right Here 1954 (Stedelijk Museum, Amsterdam); Not There – Here 1962 (Centre Georges Pompidou, Paris); Now I 1965 (private collection) and Now II 1967 (Menil Collection, Houston); The Moment I 1962 (Kunsthaus Zürich, Zürich); The Moment II 1962 (private collection); and Be I (Second Version) 1970 (Detroit Institute of Art, Detroit). 10. Consider an opposing view. For philosopher Dieter Mersch, ‘Newman’s objects, which cannot be called paintings or sculptures, form no artworks, no media: within them, the event itself, which is auratic as well as ecstatic, becomes manifest’. (Dieter Mersch, Die Medien der Künste: Beiträge zur Theorie des Darstellens, Munich 2003, p.170; trans. 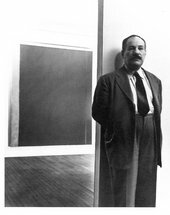 and quoted by Eva Ehninger,‘“Man is Present”: Barnett Newman’s Search for the Experience of the Self’, in Paul Crowther and Isabel Wünsche (eds. ), Meanings of Abstract Art: Between Nature and Theory, New York and London 2012, p.157 note 33. Emphasis added.) The ‘manifest[ation]’ of an ‘event itself’ would seem utterly to transcend conventions: that is what makes the event ‘auratic’ and ‘ecstatic’. In this anti-representational account, it is as if Newman’s paintings were not paintings (‘no artworks, no media’) but rather magic or religious objects that occasion moments of divine revelation independent of language, signification and artistic intentionality. 11. Adam remained in Newman’s studio until its sale to Heller. The work was purchased from Heller by Tate in 1968. 12. In Newman’s shows at Betty Parsons in 1950 and 1951, all the paintings exhibited were simply designated by numbers (if they had titles, they were not revealed at that time). Curator Ann Temkin notes the artist’s ‘sudden advent of titles’ on the occasion of his third one-man show at Bennington College in Vermont in 1958, a practice that appears first a year earlier in receipts to Heller for the sale of Adam in 1957; see Temkin, ‘Barnett Newman on Exhibition’, in Temkin 2002, p.51. But the pairing of Adam and Eve may have been on Newman’s mind before he gave them names. In 1983 Newman’s wife Annalee suggested the coupling of the works to have been established at the time of their manufacture (that is, in 1950 and 1951), writing: ‘I think he thought of them as a pair because he worked on the first painting and then on the second continuously until they were finished and then named them “Adam” and “Eve”’. (Annalee Newman, letter to Ronald Alley, 6 April 1983, Tate Acquisition File, Barnett Newman, TG 4/2/773. I thank James Finch for bringing this document to my attention.) During the 1950s Newman expressed his ambivalence with regard to titles (Newman, ‘Remarks at Artists’ Sessions at Studio 35’ , in O’Neill 1990, pp.240–1), but in 1970 he stressed their importance to him as a strategy for preventing the audience from taking his works of art as mere ‘objects’ or things, telling filmmaker Emile de Antonio: ‘The problem of giving work titles is a complicated and a personal problem. If you don’t give the work titles and you give them numbers, you are in effect giving them titles, too; what you are saying is that your paintings are objects which you are numbering … I realized that the issue was an important one for me, because the title could act as a metaphor to identify the emotional content or the emotional complex that I was in when I was doing the painting … which had its subject matter, had its content that had an effect on me and therefore I hoped would have an effect on anybody else who saw the painting’. Newman 1970, p.305. 13. 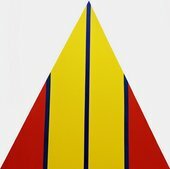 Newman referred to the signature vertical elements in his paintings variously as lines, stripes, bands and zips. For a discussion of his terminology, see Sarah K. Rich, ‘The Proper Name of Newman’s Zip’, in Melissa Ho (ed. ), Reconsidering Barnett Newman, New Haven 2005, pp.96–114. 14. I am discussing the visual appearance of the colours, not their chemical constitution. Although the actual pigment identification in Adam remains unconfirmed, conservators at Tate have proposed that its brown colour is a combination of iron oxide, cadmium orange and extenders (most likely a shade produced by a combination of commercial tube paints). I thank Rachel Barker, Paintings Conservator at Tate, for sharing this information with me. 15. Barnett Newman, ‘Interview in São Paulo’, Voices of America, United States Information Agency, 1965, audiotape, Barnett Newman Foundation Archives, New York; quoted in Temkin 2002, p.192. Of course, Newman would have been aware that in Hebrew, ‘Adam’ means variously ‘man’, ‘earth’ and ‘red’. 16. Barnett Newman, ‘Interview with David Sylvester’ [1965, revised 1972], in O’Neill 1990, p.254. 18. Ibid., pp.22–3. Emphasis added. 19. Newman subtly modified the right-most band of Vir Heroicus Sublimis in 1951 because it looked ‘a little soft’ to him (ibid., p.23). For more on this painting see Michael Schreyach, ‘Immanent Iconography’, in Schreyach 2018. 20. 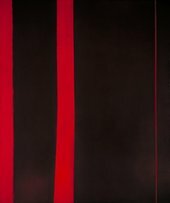 In a penetrating analysis of Newman’s series The Stations of the Cross: Lema Sabachtani 1958–66 (National Gallery of Art, Washington, D.C.), Mark Godfrey suggests that the meaning of the cycle ‘was never … a matter either of form or iconography, but of affect’. See Mark Godfrey, ‘Barnett Newman’s Stations and the Memory of the Holocaust’, October, vol.108, Spring 2004, p.38. 21. Barnett Newman, ‘Statement’ , in O’Neill 1990, p.178. 22. Art historian Yve-Alain Bois draws attention to the staged character of the poses, as well as of those seen in additional photographs by Juley showing Annalee Newman in her husband’s studio, standing close to The Voice 1950 (Museum of Modern Art, New York) and The Name II 1950 (National Gallery of Art, Washington, D.C.) while looking sidelong at their surfaces. See Yve-Alain Bois, ‘Newman’s Laterality’, in Ho 2005, pp.42–4. 23. See Michael Schreyach, ‘Exposing Creation’, in Schreyach 2018. 24. On projected standpoints as determining the viewer’s imaginative involvement in the fictional world of the work of art, see Wolfgang Kemp, ‘The Work of Art and its Beholder’, in Mark Cheetham, Keith Moxey and Michael Ann Holly (eds. ), The Subjects of Art History: Historical Objects in Contemporary Perspectives, Cambridge and London 1998, pp.180–96; and Charles Palermo, ‘Miró’s Politics’, Nonsite.org, no.8, 20 January 2013, http://nonsite.org/feature/miros-politics, accessed 10 January 2018. 25. On the historical development of a mode of painting that seems to address or to face the viewer in an instant (a quality he terms ‘facingness’), see Michael Fried, Manet’s Modernism, or The Face of Painting in the 1860s, Chicago and London 1996. 26. I say ‘pictorial dimension’ since the phrase captures something of the complex visual appearance of Newman’s colour planes, and covers a range of effects from flatness to extension, neither depth nor volume in the usual sense. 27. On the variety of means by which Newman controlled the edges of his bands and their significance, see Richard Shiff, ‘To Create Oneself’, in Shiff, Mancusi-Ungaro and Colsman-Freyberger 2004, pp.54–5. 28. The elimination of illusionistic space preoccupied Newman (see the discussion in Shiff 2004, pp.60–3). In the mid-1960s Michael Fried described how Newman’s canvases challenge a viewer’s sense of the spatial dimensions proper to the perception of painting: ‘Newman’s best paintings address themselves to eyesight alone in that they comprise an illusion of spatiality itself rendered sheerly optical – that is, of space experienced in sheerly visual terms – much as the paintings of the Old Masters comprise the illusion of space rendered in a largely tactile pictorial vocabulary. Newman’s paintings are objects in the world, accessible to touch as well as to sight. But the illusion they seek to create is of a space accessible to and addressed to eyesight alone, of an experience of spatiality that is purely and exclusively visual.’ (See ‘Three American Painters: Kenneth Noland, Jules Olitski, Frank Stella’ , in Fried’s Art and Objecthood: Essays and Reviews, Chicago and London 1998, p.232. Emphasis in the original.) A few years earlier, Fried discussed Adam (in its second state) in relation to what he deemed to be Newman’s sometimes compromised attempts to overcome ‘geometrical thinking’; see Michael Fried, ‘New York Letter’, Art International, vol.6, no.10, December 1962, p.57. 29. To clinch the observation about Newman’s plane and its quality of facingness, consider a few technical details. As Carol Mancusi-Ungaro’s conservation research has taught us, Newman fastidiously prepared, stretched and framed his own canvases (see Mancusi-Ungaro, ‘The Paintings of Barnett Newman: “Involved Intuition on the Highest Level”’, in Shiff, Mancusi-Ungaro and Colsman-Freyberger 2004, pp.118–19). On auxiliary supports he would attach, along each wooden bar of the stretcher or strainer that faced the canvas, slats of two-centimetre, quarter-round floor moulding. Since the rounded edge of the moulding was positioned to curve away from the surface, the canvas would be held taut with none of the fabric resting on the stretcher bars themselves. The lift provided by the rounded bevel mitigates against creating, on the painted side of the canvas, impressions of the frame that could appear due to its pressing against the wooden bars. Ghost-like boxes, should they appear in the image, would automatically set up a virtual frame-within-a-frame, and therefore evoke the kind of recession into space associated with conventional mimesis (painting as a ‘window’ onto the world). Secondly, the sizing and grounds of most of Newman’s canvases (rabbit skin glue and, until 1958, his own recipe for white gypsum ground) are not applied to portions of the canvas surface that turn around the tacking margins (which are usually covered just with tape, although sometimes they are painted). The result is an extremely emphatic plane. Key examples are the canvases of the Stations of the Cross cycle, in which, according to Mancusi-Ungaro, Newman ‘retained the sharp termination of the design layer at the fold of the tacking edge. The resultant precision of the edges intentionally intensifies focus on the design layer in a way that, for example, Rothko’s consistently painted tacking edges do not’ (Mancusi-Ungaro 2004, p.127). This was also the case for Adam. Although it has since been re-stretched – with the result that part of its painted surface now turns visibly around the tacking margins – it is clear that, initially, the priming extended only to the original fold edge. My thanks to Rachel Barker for discussing this issue with me. See also the account of Newman’s preparation of his ‘elaborate wooden strainers’ (many of which have been replaced by re-stretching) in Temkin 2002, p.48. 30. On Newman’s vertical address, see especially Yve-Alain Bois, ‘Perceiving Newman’, in Painting as Model, London and Cambridge, Massachusetts 1990, pp.187–213 and 309–12. 31. The classic analysis of embodiment is that of Newman’s contemporary, Maurice Merleau-Ponty, in his Phenomenology of Perception , trans. by Donald A. Landes, London and New York 2012. On Merleau-Ponty and Newman, see Bois 1990; Galen A. Johnson, ‘The Invisible and the Unrepresentable: Barnett Newman’s Abstract Expressionism and the Aesthetics of Merleau-Ponty’, Analecta Husserliana, no.75, 2002, pp.179–89; and Michael Schreyach, ‘Barnett Newman’s “Sense of Space”: A Noncontextualist Account of Its Perception and Meaning’, Common Knowledge, vol.19, no.3, Spring 2013, pp.351–79. 33. The cliché that Newman’s painting’s eradicate one’s sense of self takes numerous forms against which the artist frequently spoke; for an example of the exaggeration, see Peter Schjeldahl, ‘Lord Barney: Barnett Newman’s Majestic Abstractions’, New Yorker, 15 April 2002, www.newyorker.com/archive/2002/04/15/020415craw_artworld, accessed 11 January 2018. 35. Newman was committed to the undividedness of cognitive or propositional content and intuition. He termed the psychological and physical feeling of their imbrication as ‘involved intuition on the highest level’ or ‘intellectual intuition’ (Newman 1963, p.21). 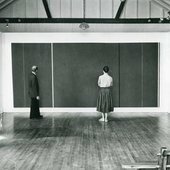 For an account that stresses the capacity of Newman’s art to ‘convey thought’ (not just provide an occasion for an affective experience), see Wouter Davidts, ‘“As Pointless as a Yard Rule”: Barnett Newman and the Scale of Art’, in Jennifer L. Roberts (ed. ), Scale, Chicago 2016, pp.146–77. 36. Newman, ‘Chartres and Jericho’ , in O’Neill 1990, p.194. Emphasis added. 38. Newman 1965/1972, p.258. Ellipsis in the original. 39. Newman, ‘Interview in São Paulo’ ; quoted in Temkin 2002, p.192. 40. Newman 1965/1972, p.259. Emphasis added. 41. As I am using the phrase, a ‘point of view’ is taken to mean something different from the standpoint we literally occupy; it is an imaginative possibility of situation, existing in contradistinction to our actual, empirical position. 42. What is surprising, though, is the tendency of scholars to generalise about Newman’s works (a problem one encounters also in scholarship on Jackson Pollock). We lack specific accounts of how each individual painting technically succeeds (or fails) to establish the presumed relationship. Additionally, interpreting in each case the precise mode of that relationship – determining its qualitative outlines, finding out what it is like and how it creatively determines one’s experience of oneself and others – is an important part of interpreting the meaning of Newman’s art. I see the promise of such a project adumbrated by Yve-Alain Bois; in his discussion of Newman’s ‘present tense’, which he regards as the effect of direct or immediate pictorial address between an ‘I’ and a ‘you’, Bois reminds us that ‘analyzing the precise means through which Newman conveys this present tense in each of his canvases – he does so differently each time – would require a whole treatise’ (Bois, ‘Here to There and Back’, Artforum, March 2002, p.107). Bois offers us a glimpse of what that kind of study could be like in his excellent ‘On Two Paintings by Barnett Newman: Abraham and Galaxy’, October, no.108, Spring 2004, pp.3–17 and 28–34. See also Bois, ‘The Wild and Company’, October, no.143, Winter 2013, pp.95–125; Ehninger 2012; and Lisa Frye Ashe, ‘On Barnett Newman’s The Wild’, Art Journal, vol.73, no.1, Spring 2014, pp.31–43. 43. In 1939 art critic Clement Greenberg put it this way: ‘A society, as it becomes less and less able, in the course of its development, to justify the inevitability of its particular forms, breaks up the accepted notions upon which artists and writers must depend in large part for communication with their audiences. It becomes difficult to assume anything. All the verities involved by religion, authority, tradition, style, are thrown into question, and the writer or artist is no longer able to estimate the response of his audience to the symbols and references with which he works’. Clement Greenberg, ‘Avant-Garde and Kitsch’ , in John O’Brian (ed. ), Clement Greenberg: The Collected Essays and Criticism, Volume 1: Perceptions and Judgements, 1939–44, Chicago 1986, p.6. 44. Mark Rothko and Adolph Gottlieb (with Barnett Newman), ‘Letter to Edward Alden Jewell’, New York Times, 13 June 1943, section 2, p.X9. 45. An essential study of these issues in modernism is Charles Palermo, Modernism and Authority: Picasso and His Milieu around 1900, Oakland 2015. Palermo warns against the art historical tendency to ‘let historical research stop paintings from addressing themselves to us who live outside the context of production from which they arose’ (p.7). Newman’s structures of beholding are what, on my account, leave room for his metaphysics of relationship. As Palermo puts it: ‘The painter claims the authority of one with something compelling to reveal who is in a position to reveal it. A beholder’s task is to rise to the occasion the painter produces’ (p.10). Michael Schreyach, ‘Beholding Adam: Scale and Standing’, in Michael Schreyach (ed. ), In Focus: Adam 1951, 1952 by Barnett Newman, Tate Research Publication, 2018, https://www.tate.org.uk/research/publications/in-focus/adam/beholding-adam, accessed 20 April 2019.